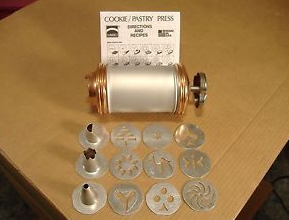 My mom had a cookie press that I absolutely loved to use to make spritz cookies. I don't know why I thought of it this year but I realized that I hadn't made—or had—spritz cookies for an entire decade! I know this because I don't have a cookie press and we're coming up on our tenth anniversary. 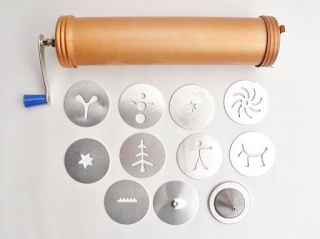 So, I researched cookie presses a bit and sent a link to Andrew, for a gift-buying reference. You rested the little feet on the cookie sheet and then turned the crank until just the right amount of dough came out and then you had to artfully lift it off the cookie sheet. I worked out how to use a few of the discs—each one called for a unique touch—and this was seriously my favourite kind of cookie to make. I always got bored rolling balls of dough or dropping by the spoon to bake (and the fridge would sit in the fridge and sit in the fridge and sit in the fridge), but somehow turning that crank kept cookie-making interesting. I don't know why. No one ever fell in love with this press. It was too wide to grip and you had to screw down the dough rather than crank a handle, which was difficult to do when you couldn't grasp the tube. And the feet bent soon after it was purchased. And the disks were always slipping out of place. And dough would get stuck in all the parts and turn a nasty grey colour. It was the worst. But I still used it sometimes because spritz cookies are seriously so good. But then I got married and moved out and the cookie press stayed at my mom's house. On Saturday, though (I think it was Saturday) a package arrived at our house. Andrew asked if I wanted to wait until either our anniversary or Christmas or if I just wanted it now and I said that now was fine since (a) I knew what it was already and (b) we have holiday baking to do! The kids and I tried it out after school on Monday and we were all thoroughly impressed. It's the Kuhn Rikon Cookie Press, though it's more of a cookie "gun" than a press. The tube is narrow enough to be able to hold easily and instead of cranking or turning, you just pull the trigger. One pull for each cookie—it's all pre-calibrated. The kids had a lot of fun with that part (especially Benjamin, who's way too fascinated by guns lately (he asked me if we could make a gun today and I said no, because I don't like guns, and he said, "Well, we could make just a fake gun. Fake guns don't have pew-pewers in them." It's possible he's never heard the word "bullet" in his life.)). We mostly made Christmas trees, though we also made some wreaths and, accidentally, some pink butterflies (we thought it was an angel but it definitely wasn't). The kids had a lot of fun decorating the trees with sprinkles. Zoë had a lot of fun watching. And take two, with Zoë banging her hand on her tray and squealing because making cookies is so terribly exciting. Rachel asked if she could get a cookie press for Christmas, too, but I told her that would be silly because she can just share mine until she moves out. "Awesome! Just ten more years before I get my own cookie press!" she said. I was telling Andrew about it when he got home from work and Miriam overheard us and said, "Can I get a cookie press when I move out, too? And Benjamin overheard her saying that and echoed, "Can I get a cookie press when I move out, too?" "Yes, yes," Andrew promised. "Everyone can have a cookie press when they move out." "Really?!" 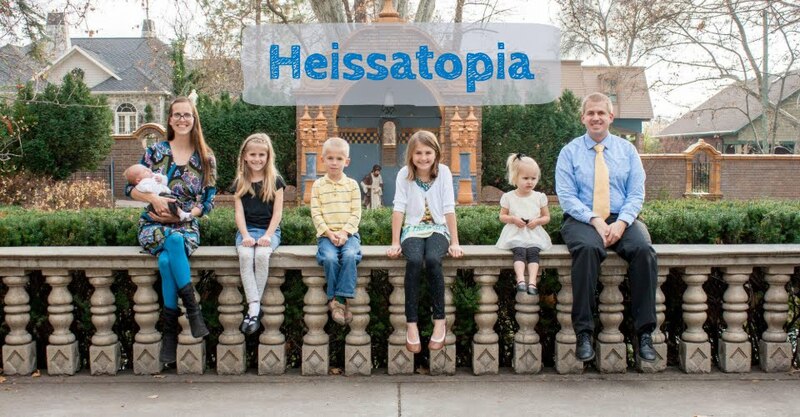 the kids wanted to know. "If you remind me that I made this promise, then yes. I will buy each one of you a cookie press when you move out," Andrew clarified. There was much celebrating and calculating of years until any given child is due to leave the nest (and earn their own cookie press). Oh, and cookie-eating. There was quite a bit of cookie eating, too.